United Nations and European Union leaders have condemned the executions in Baghdad of two of former Iraqi president Saddam Hussein's top aides. UN chief Ban Ki-moon said he regretted the move, while a top EU official said it had damaged Iraqi reconciliation. The US and UK also expressed concern about the conduct of the executions. Barzan Ibrahim and Awad Hamed al-Bandar were hanged for crimes against humanity - Barzan was decapitated by the noose, but officials said it was an accident. 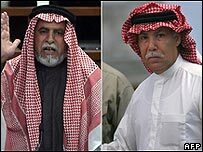 A half-brother of Saddam Hussein, Barzan was Iraq's former intelligence chief and al-Bandar was the former head of the Revolutionary Court. I would be the first to say that we were disappointed that there was not greater dignity given to the accused under these circumstances. 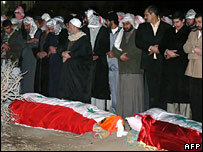 The two men were convicted alongside Saddam Hussein over the killing of 148 Shias in 1982. Their executions came just over two weeks after Saddam Hussein was put to death in Baghdad. The manner of his execution drew international criticism after unofficial mobile phone footage showed him being taunted and insulted in his final moments. The United Nations reacted strongly to the announcement of Monday's executions. UN spokesman Michele Montas said Mr Ban "regrets that despite pleas from himself and the high commissioner for human rights to spare the lives of the two co-defendants, they were both executed". UN High Commissioner for Human Rights Louise Arbour also condemned the hangings, saying that they could "make it more difficult to have a complete judicial accounting of other, equally horrendous, crimes committed in Iraq". EU External Relations Commissioner Benita Ferrero-Waldner said that the executions were "detrimental also to the question of national reconciliation" in Iraq, while a number of European leaders restated their opposition to the death penalty. US and UK officials also expressed concern about the way in which the death sentences were carried out. Both US Secretary of State Condoleezza Rice and a spokesman for UK Prime Minister Tony Blair raised concerns about the dignity afforded to the condemned men. But the Iraqi authorities defended the conduct of the executions. Journalists were shown a video recording of the events in an apparent attempt by officials to make it clear that the decapitation of Barzan was an accident. In it the two men, both dressed in orange boiler suits, were seen being led to the gallows. Executioners in balaclavas placed hoods round their heads, then the noose. The two men were then seen to fall, after which the footage showed Barzan's decapitated body. Iraqi spokesman Ali al-Dabbagh said that the condemned men had not been taunted or insulted before their deaths and that the executions had been carried out "in accordance with the law". Barzan's decapitation was "a rare incident", he said. But the BBC's Mike Wooldridge in Baghdad says the authorities' defence of the procedures shows little sign of stemming this new controversy, particularly when the government could ill-afford to have anything go wrong on this occasion.